"(Let Me Be Your) Teddy Bear" (June 11, 1957) "Jailhouse Rock"
"Jailhouse Rock" is a song written by Jerry Leiber and Mike Stoller that first became a hit for Elvis Presley. 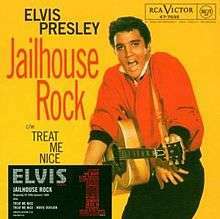 The song was released as a 45rpm single on September 24, 1957, to coincide with the release of Presley's motion picture, Jailhouse Rock. The song as recorded by Presley is #67 on Rolling Stone's list of The 500 Greatest Songs of All Time and was named one of The Rock and Roll Hall of Fame's 500 Songs that Shaped Rock and Roll. In 2004, it finished at #21 on AFI's 100 Years...100 Songs survey of top tunes in American cinema. On 27 November 2016, the Grammy Hall of Fame announced its induction, along with that of another 24 songs. The single, with its B-side "Treat Me Nice" (another song from the film's soundtrack) was a US #1 hit for seven weeks in the fall of 1957, and a UK #1 hit for three weeks early in 1958. It was the first record to enter the UK charts at No. 1. In addition, "Jailhouse Rock" spent one week at the top of the US country charts, and reached the No. 2 position on the R&B chart. In 2005, the song was re-released in the UK and reached No. 1 for a single week, when it became the lowest-selling number 1 in UK history, and the first to enter at No. 1 twice. The Beatles regularly performed "Jailhouse Rock" starting in 1958 (as The Quarrymen) and continuing all the way through 1960 with John Lennon on lead vocal; no recording is known to survive. Quarryman Len Garry (in his book "John, Paul & Me - Before The Beatles" p. 168) states that the group actually started performing the song in 1957. "Jailhouse Rock" was performed regularly in a medley along with many old rock and roll hits by Queen as early as 1970 and was the opening song on Queen's 1979 Crazy Tour and the 1980 North American tour for The Game. It is the last song in the motion picture The Blues Brothers. The song is featured in the 1995 film Casper and the 2006 animated television film Leroy & Stitch. American Idol Season 5 contestant Taylor Hicks performed it on May 9, 2006, and Season 7 contestant Danny Noriega performed it on February 20, 2008. In an episode of Full House, Jesse and Becky sing this song at their wedding reception. The song was used on Dancing with the Stars for four different jives by Lisa Rinna, Lil' Kim, Tommy Chong and Alek Skarlatos. The song is included in the musical revue Smokey Joe's Cafe. The song was also recorded by Jeff Beck and was published in the album Best Of Beck. Scenes from the music video of the One Direction single "Kiss You" are based on the "Jailhouse Rock" production number from the Elvis film. ↑ "Jailhouse Rock". In Rolling Stone, December 9, 2004. ↑ Philip Brett, Elizabeth Wood and Gary Thomas, Queering the Pitch: The New Gay and Lesbian Musicology (Routledge, 2006), p.363. ↑ Garry Mulholland, Popcorn: Fifty Years of Rock'n'Roll Movies (Orion Books, 2010). ↑ Douglas Brode, Elvis Cinema and Popular Culture (McFarland & Co., 2006), p.46. ↑ Rice, Jo (1982). The Guinness Book of 500 Number One Hits (1st ed.). Enfield, Middlesex: Guinness Superlatives Ltd. p. 34. ISBN 0-85112-250-7. ↑ Whitburn, Joel (2004). The Billboard Book of Top 40 Country Hits: 1944–2006, Second edition. Record Research. p. 272. 1 2 Kent, David (2005). Australian Chart Book: 1940–1969: the Hit Songs and Records from Thirty Years of Specially Compiled Charts. Australian Chart Book Limited. Retrieved 2013-03-03. ↑ "Ultratop.be – Elvis Presley – Jailhouse Rock" (in Dutch). Ultratop 50. Retrieved March 3, 2013. ↑ "Elvis Presley: Jailhouse Rock" (in Finnish). Musiikkituottajat – IFPI Finland. Retrieved March 3, 2013. ↑ "30, 1958/ Archive Chart: January 30, 1958" UK Singles Chart. Retrieved March 3, 2016. 1 2 3 "Elvis Presley – Awards". Allmusic. Retrieved March 3, 2013. 1 2 3 4 5 Joel Whitburn's top pop singles 1955–2006. Record Research. January 8, 2008. Retrieved March 3, 2013. ↑ "11, 1971/ Archive Chart: December 11, 1971" UK Singles Chart. Retrieved March 3, 2016. ↑ "Ultratop.be – Elvis Presley – Jailhouse Rock" (in French). Ultratop 50. Retrieved March 3, 2013. 1 2 "Dutchcharts.nl – Elvis Presley – Jailhouse Rock" (in Dutch). Single Top 100. Retrieved March 3, 2013. ↑ "3, 1977/ Archive Chart: September 3, 1977" UK Singles Chart. Retrieved March 3, 2013. ↑ "Chart Track: Week 1, 2005". Irish Singles Chart. Retrieved March 3, 2013. ↑ "Lescharts.com – Elvis Presley – Jailhouse Rock" (in French). Les classement single. Retrieved March 3, 2013. ↑ "Swisscharts.com – Elvis Presley – Jailhouse Rock". Swiss Singles Chart. Retrieved March 3, 2013. ↑ "Swedishcharts.com – Elvis Presley – Jailhouse Rock". Singles Top 100. Retrieved March 3, 2013. ↑ "15, 2005/ Archive Chart: January 15, 2005" UK Singles Chart. Retrieved March 3, 2013. ↑ "Billboard Top 50 – 1957". Billboard. Longbored Surfer. 1957. Retrieved 2013-03-03. ↑ "The CASH BOX Year-End Charts: 1957". Cash Box Magazine. 1957. Retrieved 2013-03-03. ↑ Lewisohn, Mark (September 22, 1992). The Complete Beatles Chronicles. Harmony Books. p. 363. ISBN 978-0517581001. ↑ "Jailhouse Rock". Queenpedia.com. Retrieved September 11, 2014. ↑ "One Direction's 'Kiss You' Music Video: Look By Look". ↑ Donkers, Chuck. "Bugs & Friends Sing Elvis – Looney Tunes : Songs, Reviews, Credits, Awards : AllMusic". www.allmusic.com. Ann Arbor, USA: Rovi Corporation. Retrieved August 24, 2012. ↑ "Rock de la Carcel by Micro Chips on SoundCloud – Hear the world's sounds". Soundcloud.com. September 10, 2011. Retrieved 2014-04-03.